All post-processing images on this website including all animations were made in ParaView. You can cover the complete range of post-processing from pure scientific analysis up to high level marketing images. We use ParaView in our regular training courses and we provide specific ParaView training courses on demand. Within our support packages we can help you with most topics around ParaView as well. ParaView provides a convenient graphical user interface. Furthermore, post-processing can be automated and accelerated by using ParaView’s macro system or the Python API for repetitive tasks. We provide full support and solver extensions for these automations! The internal ParaView reader can import parallel OpenFOAM® cases without the need of case reconstruction, so you can do post-processing during simulation runtime for previews and you can save storage space as well as CPU time. The OpenFOAM® library offers another ParaView reader that gives full support for selective import of cell sets, regions (CHT analysis) patches etc. 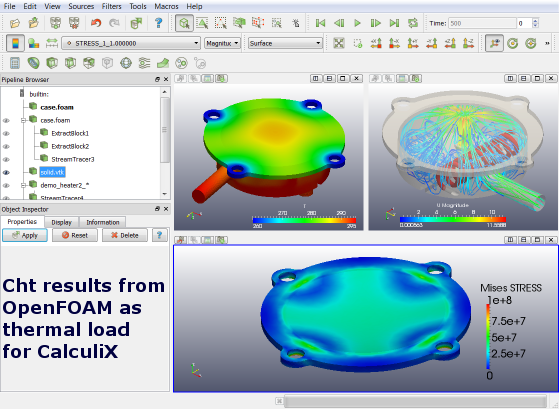 For CalculiX, DHCAE Tools provides an excellent data converter to VTK: After converting CalculiX results to the VTK format, you can import and post-process your results in ParaView right next to your OpenFOAM® results. The leading commercial post-processing tools like EnSight, FieldView or Tecplot provide direct readers for OpenFOAM® as well. From the OpenFOAM® library, translators for multiple data formats like Fluent or VTK are available. If you already found your preferred post-processing solution, you will most probably be able to use it with OpenFOAM®, too. Especially for CalculiX, the “CalculiX GraphiX: cgx” post-processor is available.